Dysfunction in the sacroiliac joint, or SI joint, is thought to cause low back and/or leg pain. The leg pain can be particularly difficult, and may feel similar to sciatica or pain caused by a lumbar disc herniation. SI syndrome can be a complicated problem to treat because sitting becomes the enemy with this condition. The SI joints can be either hypermobility (too much movement) or hypo mobility (stuck or fixed with too little movement). It seems this type of condition is occurring more and more as jobs and lifestyles have us spending more and more time sitting on a daily basis. The pain is typically felt in the lower back and/or hip and may radiate into groin area. 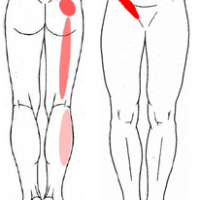 The pain can also radiate down the legs making it similar to sciatica. Accurately diagnosing sacroiliac joint dysfunction can be difficult because the symptoms mimic other common conditions, including other mechanical back pain conditions like facet syndrome as well as other lumbar spine conditions including disc herniation and radiculopathy (pain along the sciatic nerve that radiates down the leg) and even piriformis syndrome. But, some of the symptoms can be a give-away that what you are experiencing is sacroiliac pain: pain after prolonged sitting, especially transitioning from sitting to standing, while the first few steps after standing are awkward and painful, generally walking and movement makes you feel better. Also pain felt in the groin or front of the hip is often referral from the SI joints. Manual manipulation provided by a chiropractor will help. Duration of treatment depends on how long the patient has had the problem. Typically, when dysfunction has existed for a longer period of time, muscles and ligaments adapt and tighten causing alterations in gait and function that further perpetuate the problem. For a patient who has had long term issues with sacroiliac joint dysfunction (whether off and on over years or continuous for many months), treatment often requires reducing muscle spasms and trigger points before an adjustment can be successful. As patients improve from this problem, they discover that they can transition more easily from sitting to standing, that they have less trouble turning over in bed and leg pain (if present) resolves and pain becomes more focused to the SI joint itself before complete resolution. To get the most from your chiropractic care, follow your specific treatment plan. Treatment of a sacroiliac syndrome may include physiotherapies such as ultrasound, electric muscle stimulation, deep trigger point therapy or myofascial release and ice or heat, as well as chiropractic adjustments. There are many different ways to adjust the spine. The techniques used will always be customized to your needs. I had been having Hip and Lower Back Pain & Stiffness, as well as, significant swelling and stiffness in both my knees for about a year. It was really affecting my day to day life. I had trouble getting out of bed in the mornings, getting out of my car or just getting up from a seated position after sitting for a little bit. I’d say on a scale of 10 (where 10 is the worst pain) my pain and discomfort rated a 7 on a daily basis. Some friends had watched me play in a pro tournament. I was really struggling with mobility and one of my students recommended that I see Dr. Hoch. When I met with Dr. Hoch and I began telling her about all that was going on with me, I asked her if there was any hope because I was really starting to worry if I would be able to continue in my job duties as a tennis pro. She examined me and assured me my hips were still in good shape but pointed out that my sacroiliac joints were not as mobile as they should be…I think the word she used was “stuck” and that my gluteal muscles and hamstrings were really tight. She began working on me immediately and I could not believe the difference in my mobility and how I felt after just that first treatment!!! She told me it would take about 4 weeks to really work out all my problems, and I believe her because after just 4 treatments I am feeling amazing and playing great tennis after finding SI Joint Pain Relief! If you want to improve how you feel, your mobility and stay in the game for a lifetime—then you need to go see Dr. Chris! ~P.G.